Edward Elgar published the Handbook of the International Political Economy of the Corporation. The publication, to which Andreja Jaklič from Centre of International Relations (together with Filip de Beule from KU Leuven) contributed a chapter on multinational corporations, addresses the global and domestic power of corporations as well as highlights the ways in which corporations interact with each other and with their socio-political environment. 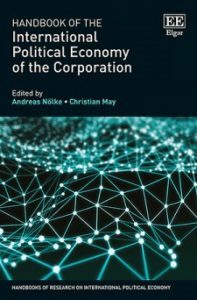 The book was edited by Andreas Nölke and Christian May from the Institute of Political Science at the Goethe University Frankfurt, Germany. More information on the publication is available here.